George B. Higgins Jr passed away Sat., Dec. 22, 2018 at North Shore Hospital, Manhasset, NY with his loving wife, Margaret "Peggy" Higgins, his son, Sean, and 2 sisters at his bedside. He will be greatly missed. Born December 15, 1947, George grew up in Manhasset, NY. He was a 1969 graduate of St. Michael's College, Vermont and received his MBA from Boston University in 1971. He returned to New York and began his career at Xerox Corporation in New York City, rising to management prior to his departure in January 1982, when he left to become President of Higgins Fire Protection, Inc. after the death of his father, who founded the corporation. He was a member of the National Fire Protection Association (NFPA) and the National Fire Sprinkler Association (NFSA). George met his wife, Peggy in NYC in 1972. They married in 1974 and loved their life together raising their family and traveling, living in NYC, purchasing their first home in Rye, NY then onto Darien, CT, where they have lived for the past 35 years. George was a loving, involved, and supportive husband, father, and friend. He will long be remembered for his generous spirit, his wit, and his indefatigable sense of humor. He loved spending time with his family, and he adored and spoiled his 3 golden retrievers, leaving Banner, who will miss George's many treats. A member of Silvermine Golf Club and Darien Boat Club, George enjoyed golfing, boating, and skiing. He was an aficionado of golf both on and off the course, always keeping his partner and competitors abreast of the rules. 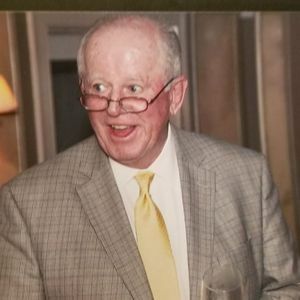 He especially cherished summers in Shady Harbor, RI, where from a young age he spent time fishing, clamming, sailing and water skiing on Quonochontaug Pond, and he has imparted his love on to the next generation. George is survived by his wife Peggy, son Sean Higgins and wife, Barrett, and adoring grandson, Parker. He is also survived by sister Catherine Higgins; sister Helen Minetti Higgins, MD, and her son Michael Minetti; mother-in-law Elizabeth Harmon; brother-in-law James Harmon and wife, Ann, and their son Christopher; sister-in-law Joanne Bryant and husband, Wayne, and their daughter Kelsey Bryant and husband Charlie Rohrer. George was a parishioner at St. Thomas More Church, Darien, CT. A Funeral Mass will be held at St. John Church, 1986 Boston Post Road Darien, CT at 10:30AM Fri., Jan. 4, 2019. In lieu of flowers, a Memorial Gift in honor of George's life may be forwarded to his alma mater, St. Michael's College, George B. Higgins Jr. (1969), Office of Institutional Advancement, 1 Winooski Park, Box 256, Colchester, Vermont 05439. Create An Online Memorial For Geroge B. Higgins, Jr. The beautiful and interactive Eternal Tribute tells Geroge's life story the way it deserves to be told in words, pictures and video.